Be greeted at the Adelaide Airport or the Parklands Railway Terminal by one of our local guides and let us show you around Adelaide on a city sights tour. 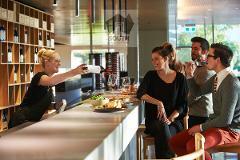 Enjoy wine tasting at the National Wine Centre and Penfolds Magill Estate. Be greeted at the Adelaide Airport or the Parklands Railway Terminal by one of our friendly local guides, have your luggage transferred to your private vehicle and let us show you around Adelaide on an informative City of Adelaide tour.